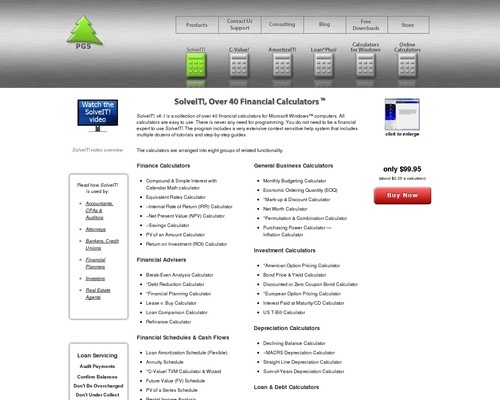 SolveIT!, Over 40 Financial Calculators is backed with a 60 Day No Questions Asked Money Back Guarantee. If within the first 60 days of receipt you are not satisfied with Wake Up Lean , you can request a refund by sending an email to the address given inside the product and we will immediately refund your entire purchase price, with no questions asked. SolveIT!, v6.1 is a collection of over 40 financial calculators for Microsoft Windows computers. All calculators are easy to use. There is never any need for programming. You do not need to be a financial expert to use SolveIT!. The program includes a very extensive context sensitive help system that includes multiple dozens of tutorials and step-by-step guides. The calculators are arranged into eight groups of related functionality. *Indicates new calculator in v6.0. ~Indicates new or updated in v6.1. Features in common for all calculators. Here’s a shortdescription of every calculator. As we mentioned, SolveIT! is easy to use. Just start it up, select a calculator and answer the questions by filling in the blanks. Click on the [CALC] button and you’ll have an instant answer to your question. That’s all there is to it. The results from any calculator can be copied to the clipboard for inclusion in another program including email or they can be printed to any printer. Additionally, you can run multiple instances of a calculator in order to make fast side-by-side comparisons. All the calculators are full featured. Calculators won’t simply do hypothetical calculations. Rather they let you reflect real world scenarios. All financial schedules show actual dates. You can adjust rates, adjust payments, deposits, or withdrawals. You can skip a payment or withdrawal. You can make extra payments or withdrawals. Many calculators let you save results to disk. Come back later and make changes to earlier assumptions. Or update a payment schedule. These calculators are the real deal. And buy with confidence.We offer a 60 day money-back guarantee. No questions asked. We believe you’ll find that SolveIT! has the most extensive collection of flexible calculators found in any program. NOTE: SolveIT! runs on Windows 7 (64-bit or 32-bit), VISTA (64-bit or 32-bit) and Windows XP (Home or Professional editions) as well as older versions of Windows (98, 98SE, ME, NT 4.0 & Windows 2000). Do you need to confirm or record payments paid on a loan? If so, then try C-Value! and our step-by-steploan servicing tutorial. Our recomended SolveIT!, Over 40 Financial Calculators for Personal Finance is backed with a 60 Day No Questions Asked Money Back Guarantee. If within the first 60 days of receipt you are not satisfied with Wake Up Lean , you can request a refund by sending an email to the address given inside the product and we will immediately refund your entire purchase price, with no questions asked. Buy Now SolveIT!, Over 40 Financial Calculators at a special discount price today - submit the offer form below and it will be shipped to you as soon as possible. It's a deal. Fill the form below NOW. LIMITED OFFER. A trial will convince you. Learn more.